2009 marked Team 341’s tenth anniversary. While we have not always been Daisies we are proud to have flowered for so long. In 2009, Daisy made her first appearance at the San Diego Regional where we took home a champion’s trophy. 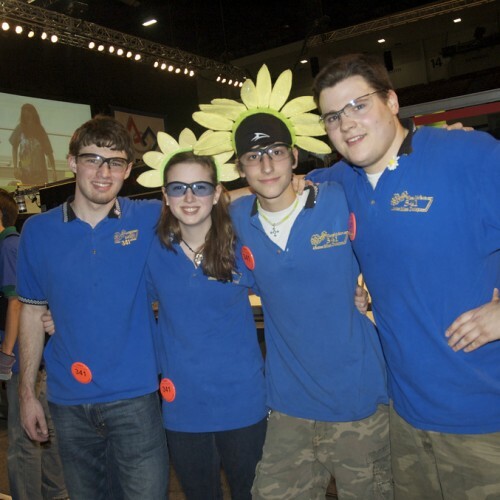 This was Team 341’s third year in a row to win a regional competition (the prior two at the Philadelphia Regional). Things didn’t really work out on the field at the Philadelphia Regional though but off the field the Daisies won the second highest honor in FIRST®, the Engineering Inspiration Award. At the international championships, we were honored again with the National Engineering Inspiration Award. FRC Kickoff in Upper Darby, Pa.
2009’s game challenge, LUNACY® simulates the conditions of the moon. LUNACY® is played on a 54′ X 27′ low friction field. There are 2 alliances composed of three teams each. The robots are required to use special wheels and tow a payload trailer. The wheels are slippery and make it hard for the robot to stop. The trailer is used for the opposing team to score points. 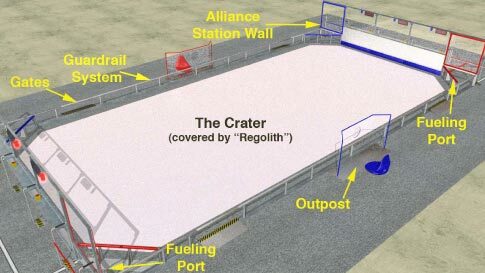 In order to score points opposing teams have to put “Orbit Balls,” into the trailers towed by the opposing alliance. Human players positioned around the arena can shoot from their own stations as well. There are three types of “Orbit Balls”: Moon Rocks (2 points), Empty Cells (2 points), and Super Cells (15 points). Super Cells need to be activated before they can be played. To activate a Super Cell, a robot has to deliver an Empty Cell from their outpost to their fueling station. Empty Cells can be delivered any time during the match but Super Cells can only be played during the last 20 seconds of the match. The first 15 seconds of the match is the autonomous period, while the following two minutes is the teleoperated period. In the beginning of each match, the trailers are empty. 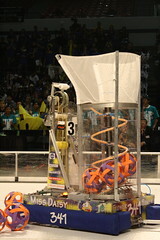 Prior to the beginning of each match, each team can fill their robot with up to seven Moon Rocks. Human players are then given twenty Moon Rocks minus the number they load into their robot. They are also given Empty Cells and Super Cells previously determined by the outcome of the last match they played. If the Team has not played a match, they are given four Empty Cells and two Super Cells. At the end of the match the total number of Cells in each trailer is counted. The Team that has scored more points in the opposing team’s trailer wins.